This week, I made my inaugural address to The Duke of Edinburgh’s International Award Forum, our world conference, which is held every three years. What follows are my speaking notes – and some of the slides that I used as illustrations. We are the world’s leading youth achievement award, bringing together practical experiences and life skills to equip young people for life. Regardless of a young person’s background or circumstances, every participant tailors their own programme to their own individual requirements and interests. That means they end up with the life skills and practical experiences that they need to embrace the challenges and opportunities life throws at them. 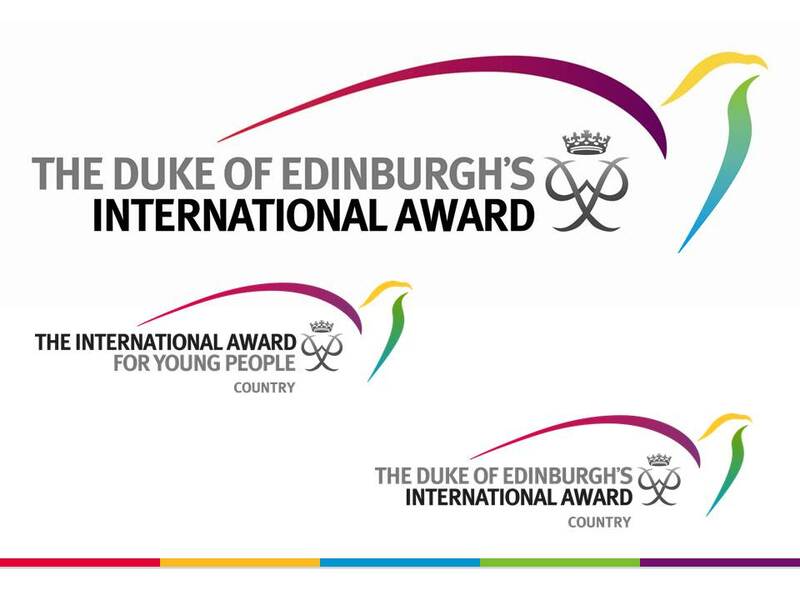 Our ambition is that every young person aged 14 – 24 in the world should have the opportunity to participate in and potentially achieve a Duke of Edinburgh’s International Award. 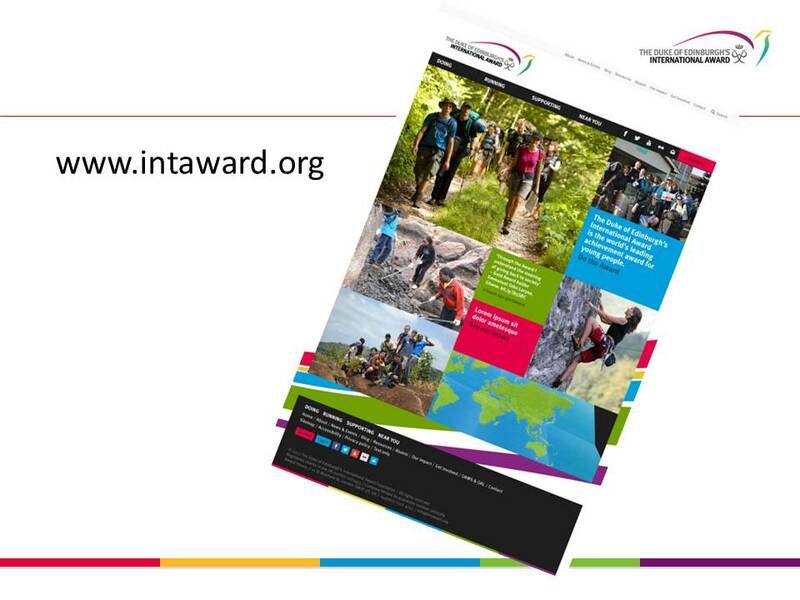 Over the last three years, representatives of National Award Authorities have been working with the staff of the International Award Foundation and experts within external agencies to make sure that we can all meet the increasing demand and need for the Award. 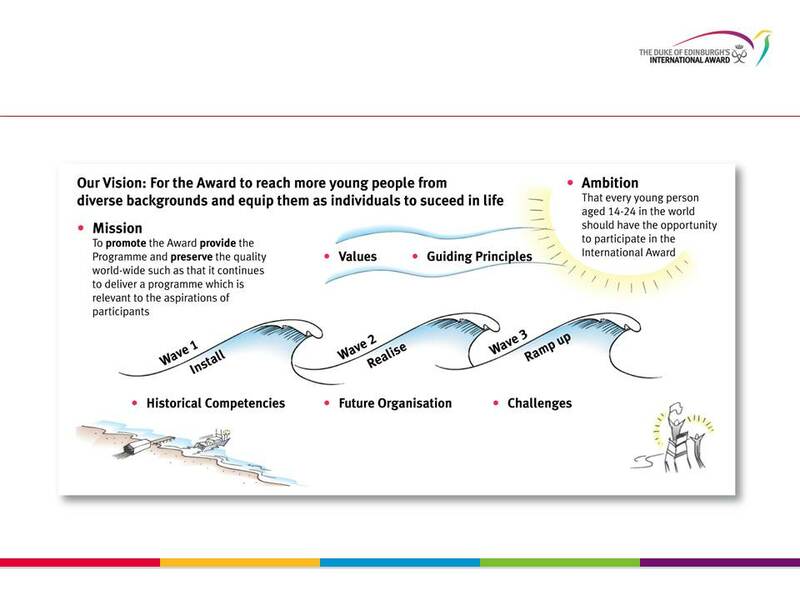 This has resulted in us developing a range of adaptable tools that will increase the capability of all of us to deliver the Award to young people and improve our responsiveness. Arguably the relevance and need for the Award is greater now than at any time in its 56 years of existence. Young people need all the help they can get to be prepared for life and work. They also need the resilience not to be defeated by the first set-backs of adulthood. Judging by the demand for the Award, many young people realise the positive impact it can have on their lives and their future. 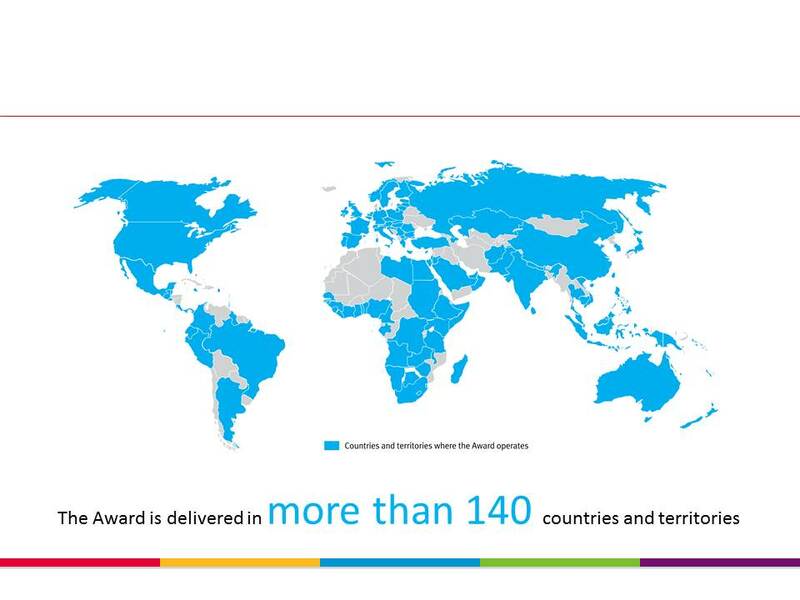 The Award now reaches out to young people in over 140 different countries and territories worldwide. We are now engaging with diverse groups of young people in many countries. The Award has spread around the world and it is often very well known within individual countries and territories. The mix of names and identities that we use, however, makes us hard to recognise internationally. We need to invest consistently in our international identity so that we can transfer the maximum value of a young person’s efforts and achievements into something with global recognition, especially among companies and universities. So, we have redesigned and modernised our visual identity. Attaching five colours to the five sections of the Award as well as incorporating the three colours of the three levels creates a colourful spectrum which will bind the Award family closer together. We have ensured that those countries and territories that have a strong national brand can keep their own identity, so they can continue to benefit from the brand equity they may have built up over many years. But we want everyone to embrace the new international brand, either as an endorsement mark or as the core visual identity for those National Award Authorities that feel ready to do so. We can now target educational institutions and employers worldwide, helping them to understandthe currency of the international brand. 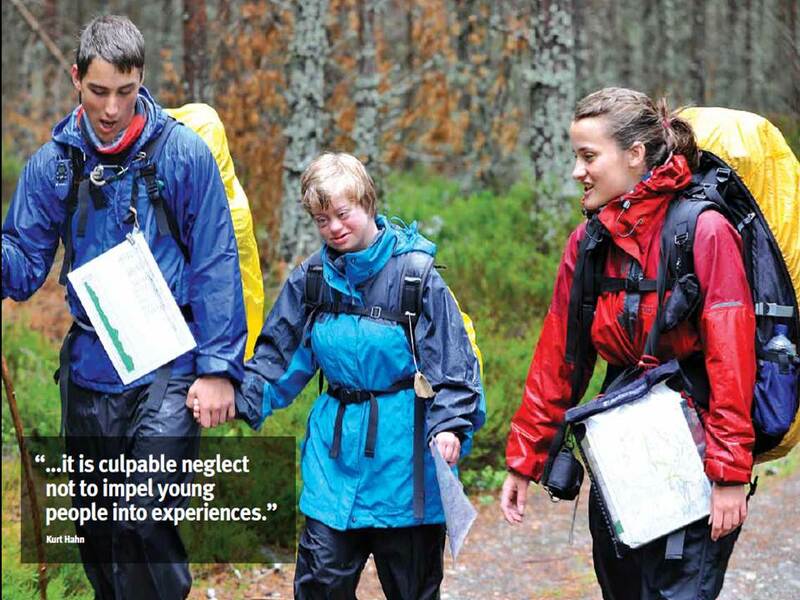 When they see mention of the Duke of Edinburgh’s International Award on a young person’s resume, application or curriculum vitae, we want them to see that as shorthand for highly relevant experience and accomplishment. As young people become more globally mobile, our role in building recognition of the world’s leading youth achievement award will become more and more important. To support this new identity and purpose we are launching a completely transformed international website, designed to provide the information and advice that visitors to it really need. We have developed a number of adaptable tools which will transform and modernise the way we interact with each other as well as bringing the Award closer together. 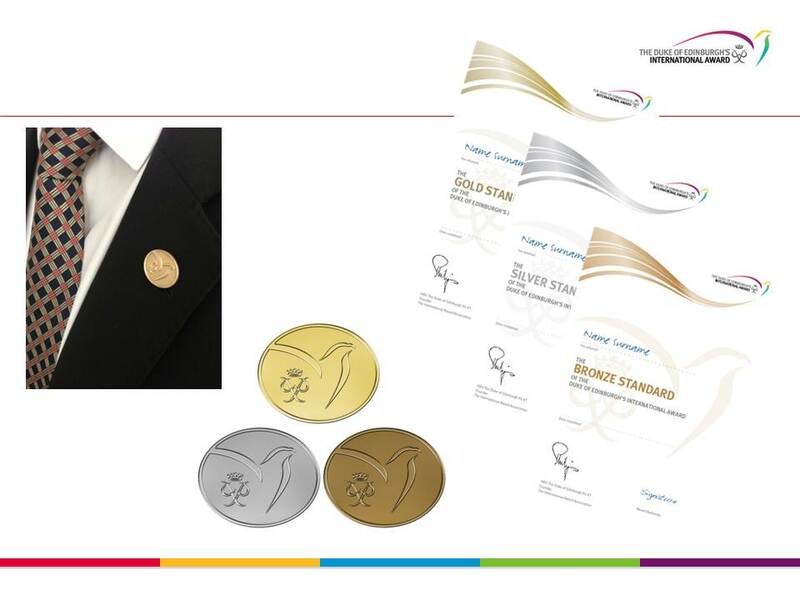 A number of National Award Authorities have been piloting these and we are now ready to roll these out around the world, respecting the differing needs and priorities of individual countries. 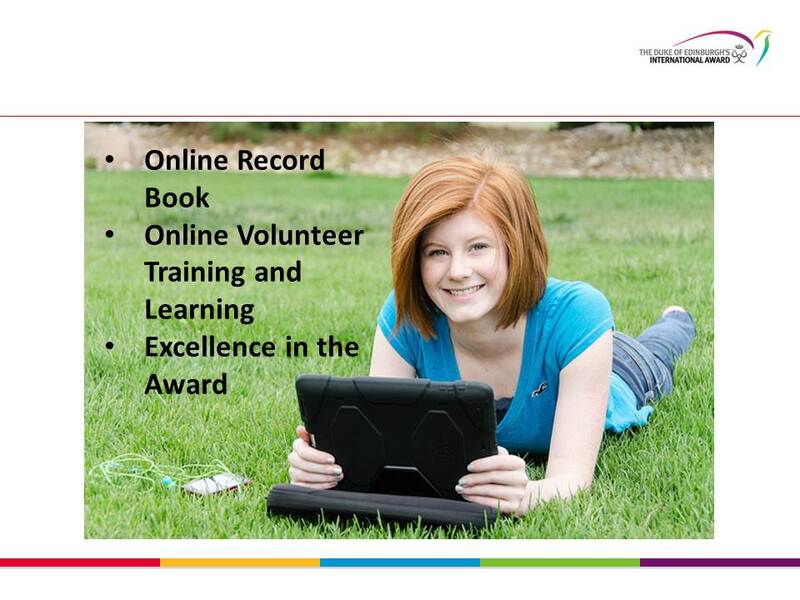 The Online Record Book empowers young people to take more control of their Award programme by going online. It transforms the former paper-based record of a participant’s activities and achievements into a dynamic, fully interactive experience. Although this is called an Online Record Book, it is actually much more. 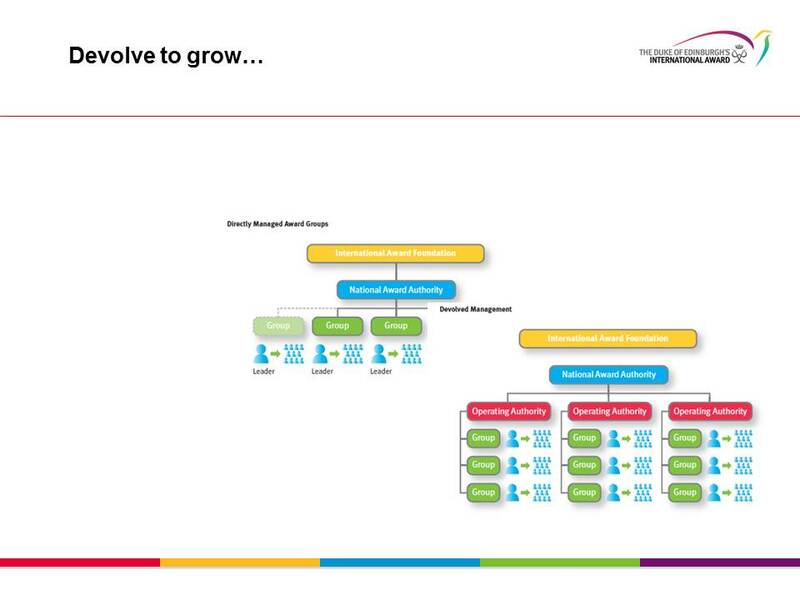 It provides the tools for a National Award Authority to transform the way it manages the Award. Those who have already developed their own systems report that doing so has reaped profound benefits in higher retention and completion rates. 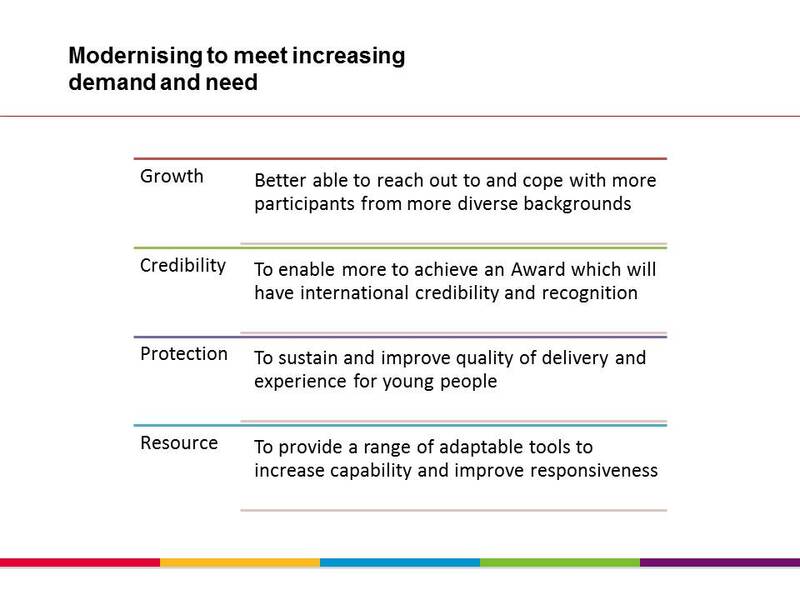 If we are going to grow the Award whilst still assuring its quality, we need to make sure that we continue to provide excellent training and support to Leaders and other adults within the Award family. Face to face training will always be an important way of delivering this, but sometimes attending a course just isn’t possible, or people want to continue reflecting on their learning long after a course is over. 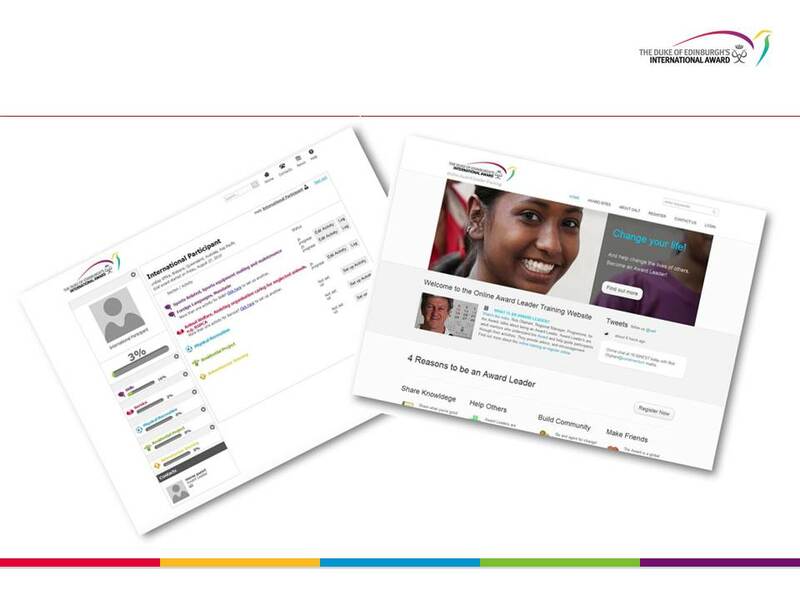 We have developed an Online Training and Support platform to provide a completely new way to engage, sustain and develop the adults upon whom participants depend. For Award Authorities this means that they will have a better record of their volunteers, their progress and the roles for which they are either qualified or hoping to be qualified. We’ve taken a close look at how we will all work together to protect the quality of the Award worldwide as we grow. Excellence in the Award transforms the way we undertake quality assurance by adapting existing best practice to the particular needs of the Award. This new process identifies a number of key areas that need to be tested, but allows Award Authorities to set their own goals and strive to achieve them with appropriate support and guidance. If we are to make a step change in the number of young people participating in the Award, we need to adopt tried and tested practices from experienced and successful Award Authorities. 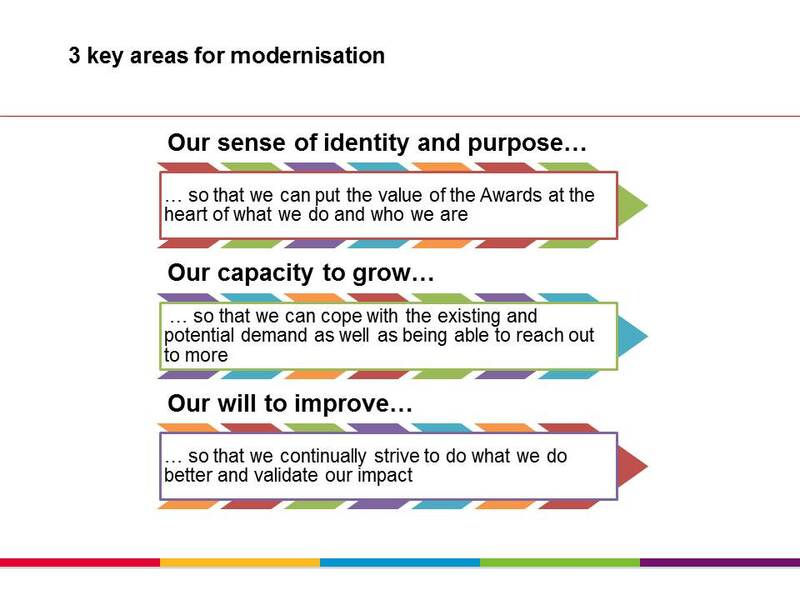 This means modernising the current directly managed Award Groups method typically adopted by most Award Authorities. Wherever practicable many existing Award Authorities combine this with a devolved method where more control of the delivery is passed to partner organisations and adults in direct touch with young people. 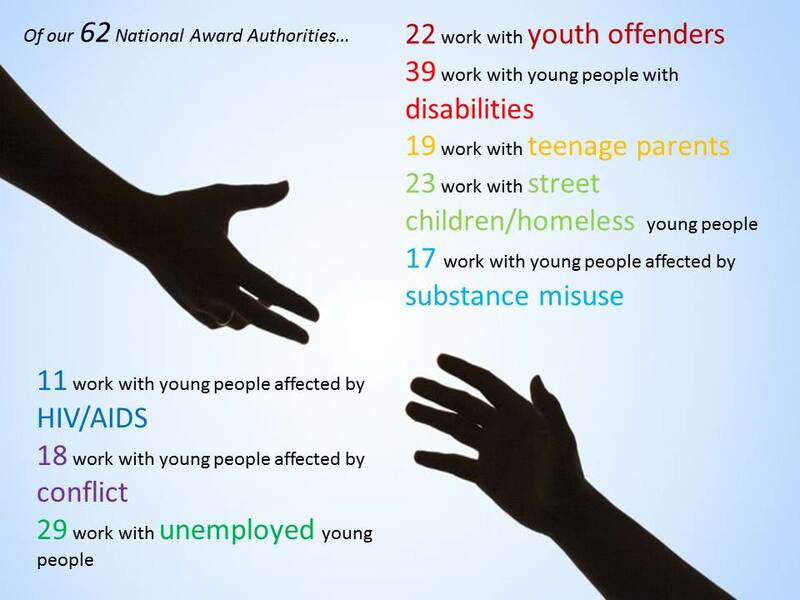 The result is a multiplication in the number of Award Groups and therefore young people being able to get involved. This has the added advantage of removing the impression that we are somehow competing with those organisations for young people’s time and commitment. We have developed a new modern licensing and standards structure to stimulate and encourage this adaptation to a different way of working. The new licences spell out the roles and responsibilities for licence holders and set clear operational standards, so that quality can be assured. They also maintain and control the intellectual property rights to the Award and the new online tools. For many years we have judged our success by our outputs. 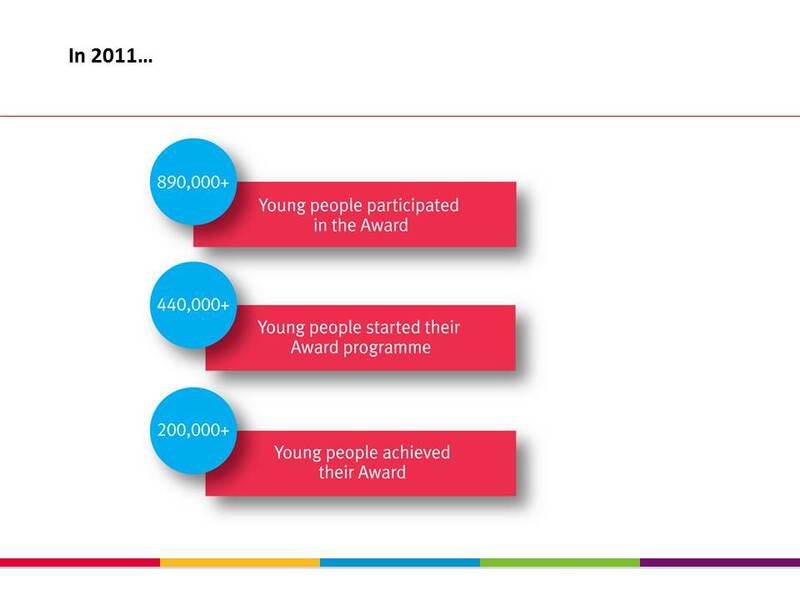 We have reported on the number of young people participating in the Award. We can measure the ratio of Awards gained against new entrants in a year and so create an Achievement Ratio. 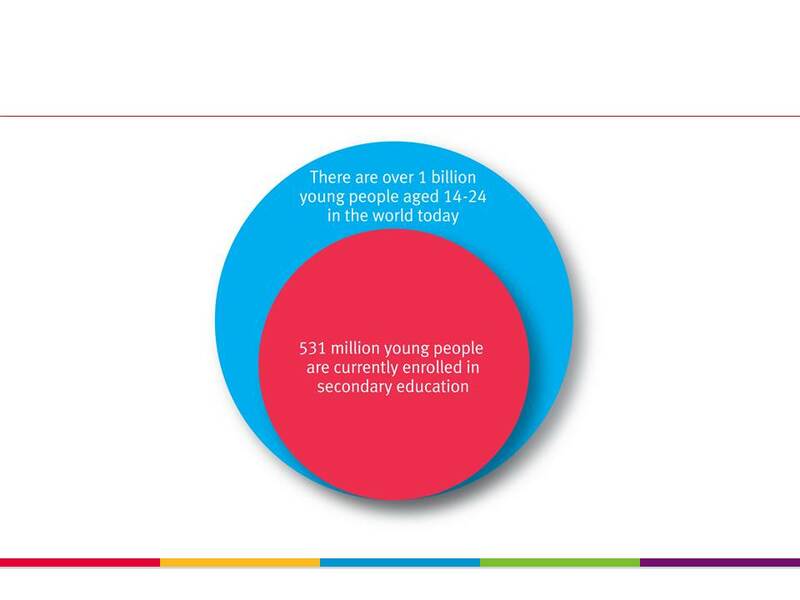 We track the number of countries involved and our penetration into the available youth market. But measuring output is now not enough. Funders in particular are increasingly focusing on the way in which organisations like us measure the impact they are having on society. In future we must consider the positive impact the Award has, for example, on reducing re-offending rates and re-engaging young people who might have succumbed to a life on social welfare into becoming net contributors. 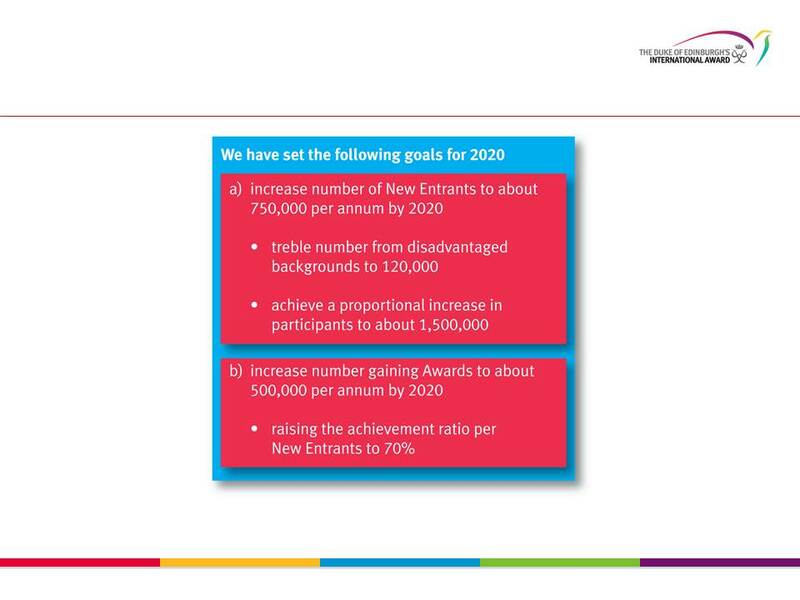 We need to calculate that value to society, and other positive outcomes the Award gives communities. 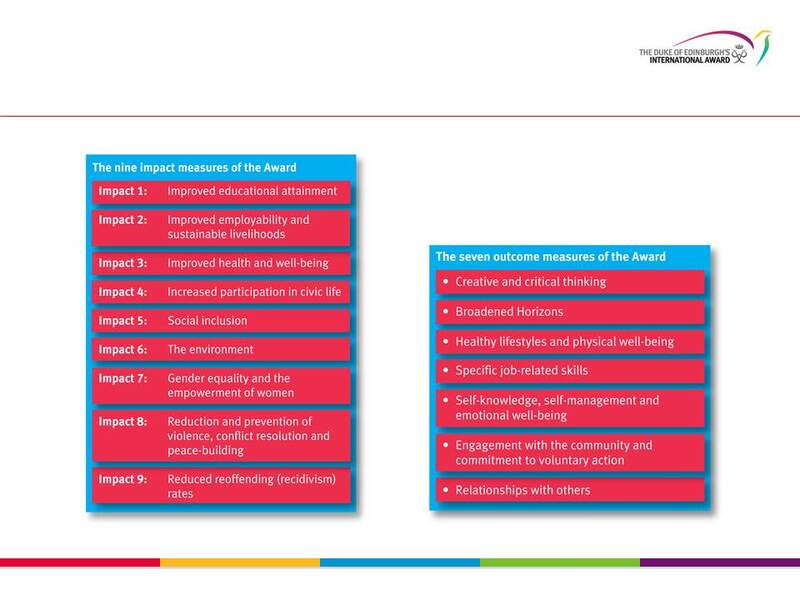 This year we published our new Impact Framework which has been enthusiastically endorsed within and outwith the Award family. We will be working with National Award Authorities to develop research tools around nine impact and seven outcome measures. We want to help set the definitions for researchers anywhere in the world so that any empirical evidence produced will be relevant and useable everywhere, allowing us to report what the Award does without having to rely purely on anecdotal evidence. Having this data will then allow us to devise our own way of quantifying our Social Return in terms of the in-kind financial contribution we make to global society. 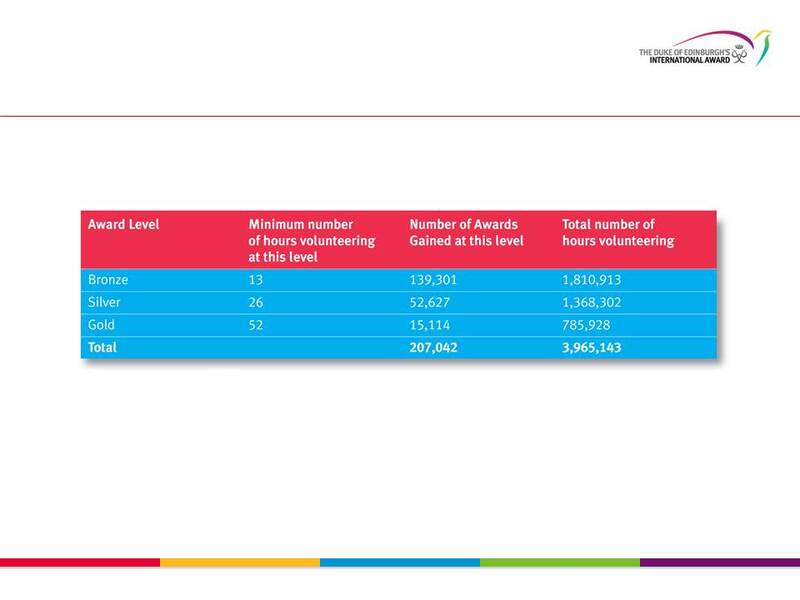 Our current estimate of our Social Return is based on putting a relatively arbitrary value (based where possible on the minimum wage in a particular country) on each volunteering hour given by a young person who achieves an Award. We calculate that, at the moment, this is approximately 30 million USD (or 18 million GBP). 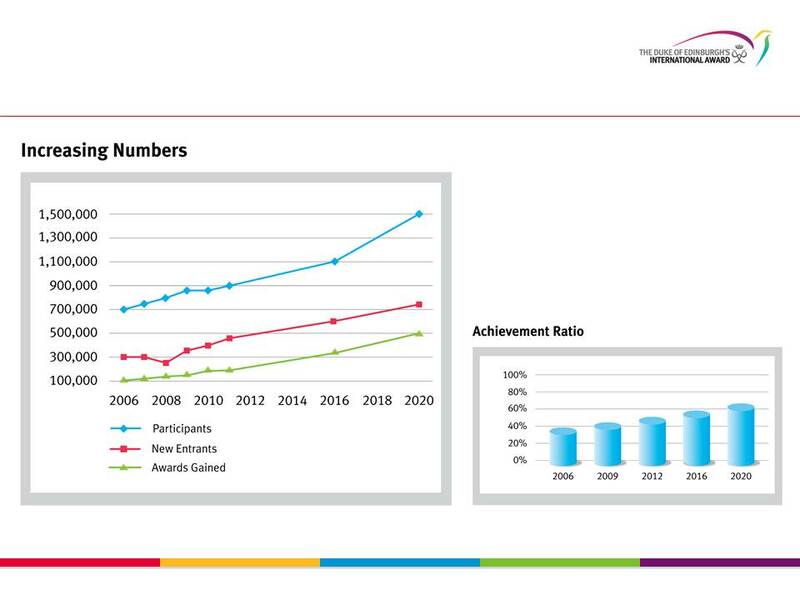 We know that this is a very conservative estimate, not least because it does not include all participants, only those who actually achieve an Award. In the future, we would like to be much more sophisticated about how we value the impact we have in the different countries of the world in which we work and among the more disadvantaged and at risk groups of young people we seek to engage, in line with our nine impact areas. We believe that, by 2020, we should treble our Social Return. All of the tools which have been referenced have been used by practitioners and people in the field. Their experiences and feedback have been employed to refine each tool. These tools will be mostly ready by the end of 2012 to roll out and install across the 140 plus countries and territories, which make up the current International Award Association, as well as being part of any start-up operator’s package in the future. Although it will take time, possibly three to four years, to deliver all the tools to everyone, and install them, the effects will be realised almost straight away, especially through the Online Record Book and Online Training and Support. While each tool has a specific role they are designed to work together to benefit all to one degree or another, whether participant, volunteer, manager or supporter. As more people convert to working with these tools and appreciate their value we will realise their full potential. In the three or four years leading up to 2020 we should experience a ramping up of operational capability, increased numbers of young people involved and a wider reach as we achieve and indeed exceed our goal. Then we’ll have the foundations in place to strive towards our ambition. The Award identified the need to modernise a few years ago. The One Award Alliance was the name of the strategy we created to meet that challenge and today we are setting about the transformation of the way in which the Award is managed and delivered. Each one of the tools we have developed has tremendous potential on its own, but when they are combined it will mean that the Award’s management will be much better informed and in touch, enabling us to be far more responsive to what is required and continually strive for improvement. More importantly all these innovations will pull the Award family closer together; we will look and feel much more connected and progressive, we will empower many more people and become increasingly more diverse while all the time inspiring and acknowledging individuals. Young people will be the biggest winners of this transformation. Through the Online Record Book they will enjoy a better and more relevant experience. Wherever they are in the world they will be participating in a consistent award programme and will achieve a world renowned and respected Award. The volunteers who will be inspiring and guiding participants through their Award programmes will have experienced one training qualification process. Their engagement in excellence in the Award will enable their voices to be clearly heard in the process to strive for improvement. Their circumstances, background, participation and achievements will provide much of the data to help drive increased recognition of the power of the Award, wider awareness and greater access for more young people. Ultimately more young people from more diverse backgrounds will have the opportunity to be equipped as individuals, to achieve an Award that has real international credibility and go on to succeed in life.